Dark orange square = documentary evidence exists that the pub was open in this decade. Mid orange square = no documentary evidence, but pub known to be open in this decade. Light orange square = pub is thought to have been trading in this decade - many more should probably be indicated. Some pubs (first occurrences of George, Greyhound, Nags Head, etc) had closed by 1820 and are therefore not shown. If pub was known by more than one name only predominant name is shown, but evidence for all names shown. Decade totals and summary statistics graphs are shown at the bottom of the chart. Records are quite scarce before 1850 and so not all premises may be listed. 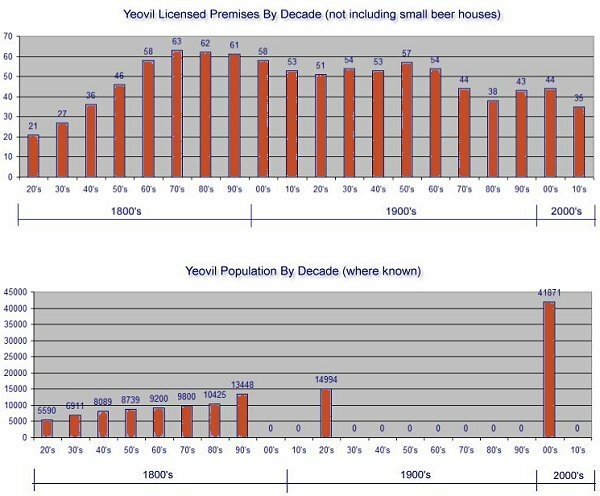 The graphs are intended as a 'rough' guide to the number of Licensed Premises in Yeovil (excluding, in the main, simple 'beer houses'). They clearly reached a peak in the 1870's, '80's and '90's. The population was steadily rising throughout the century although the figures presented may give a slightly cloudy picture due to boundary changes during the period. 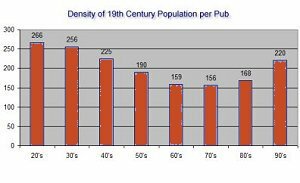 The density figures are interesting, especially from the 1850's to the 1880's where there were less than 200 people per pub. Today's figure is around 1,000.